One constant problem the Freeciv project has, is that while our Windows version has notable userbase, the development team uses almost exclusively linux (and Mac OS X). Only some of us have occasional opportunities to test how things wrk on Windows. So, even if you cannot contribute code, art, or translations to the project, simply testing things on Windows for us would be great help for the project. I have capability to make crosser-based builds for Windows always (as they are cross-compiled on my linux), and occasional opportunity to make Windows installer builds. One thing we would need evaluated is what version of gtk3 Windows bundle works best with freeciv 2.5 gtk3-client. 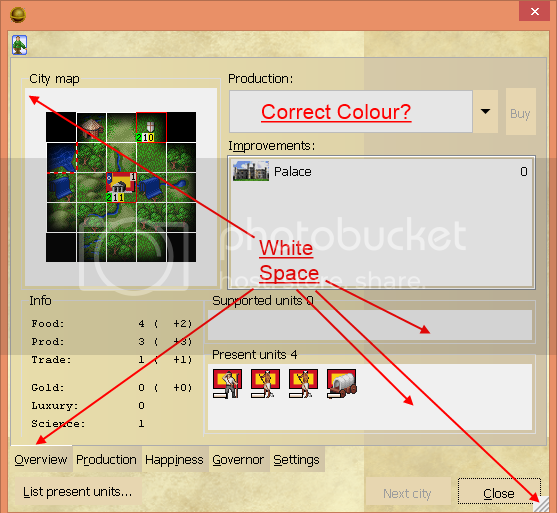 Freeciv does not require any functionality introduced after gtk3-3.4, so in theory any version after that should work. Unfortunately we've very well learned with the gtk2-client that simply taking the latest version is not always the best option. While in newer versions old bugs get fixed, and new features get introduced (which we don't need, as I said), so get new bugs (regressions), and we've had the situation where we've effectively forced to choose between bugs when selecting gtk bundle version. 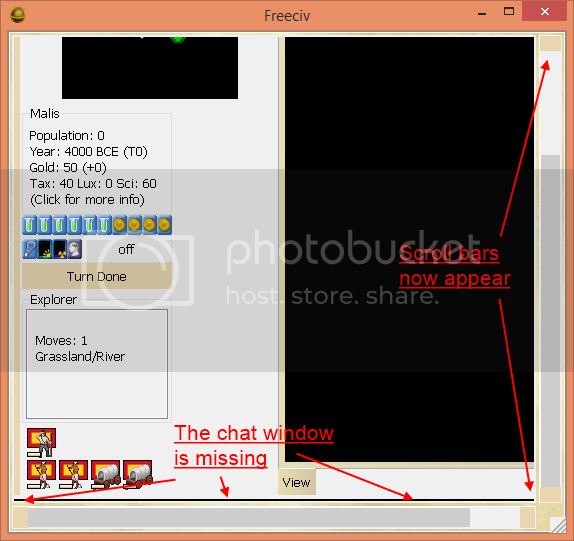 I've now built freeciv gtk3-client with all currently available Windows gtk3 bundles (3.4.2, 3.6.4, 3.8.2, 3.10.4). Freeciv itself in all these builds is exactly the same, so only the gtk3 bundle used is different. It would be important for us to know if some of them has serious problems some other does not. We've currently using 3.6.4, so we would also be interested to know if updating from that would improve things in general. Thanks for testing. Apparently libpng16 is a new dependency in gtk+-3.10.4 bundle that our scripts are not adding to the installer packet. Where should I get this libpng16 from? Or must you rebuild the exe and I must redownload it? It should be part of the installer package, so I need to build a new one. I hope to make that coming weekend, and hoping to get also some other fixes in first. I've replaced all these builds with new ones, from freeciv S2_5 r25141. which now has a scroll bar but the chat window is missing, even though the scroll bar on the right is scrolled all the way to the bottom. This version seems a lot more resource intensive (I do not have a graphic's card), there is sometimes a delay when opening a menu button. The gtk 3.4.2 is missing libffi-5.dll, it has libffi-6.dll though. 1) The 'default3' ruleset doesn't work on v2.5. 2) I agree about the poor quality font used. Hard to read. The lack of 'button not pressed' and 'button pressed' difference is frustrating. 3) Playing is very choppy and slow, but it could be that my machine is getting old. But previous versions worked and works very nicely. 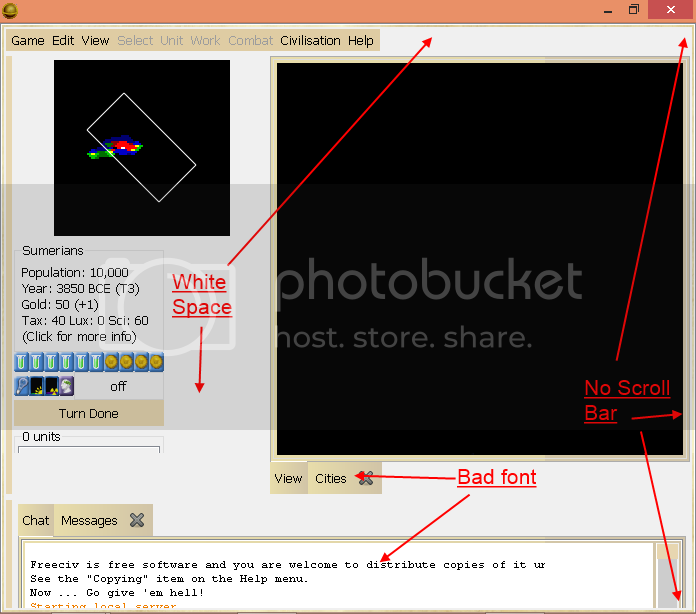 3bis) I launched a game with all default settings: I confirm that playing is very choppy. Very delayed reactions to mouse/keyboard orders. Since previous versions run just fine, I'm not blaming my machine anymore. 4) Many Nations' flags are missing. The "Statistics" column in the right side? I don't mind, but seeing other posts, I just wonder. Last edited by Arbogast on Mon Jun 16, 2014 3:28 pm, edited 2 times in total. Arbogast wrote: The 'default3' ruleset doesn't work on v2.5. The default3 ruleset isn't an official ruleset, so you'll have to contact the creator of that ruleset about updating it (or update it yourself).